Is a Papa John's takeover on the menu? 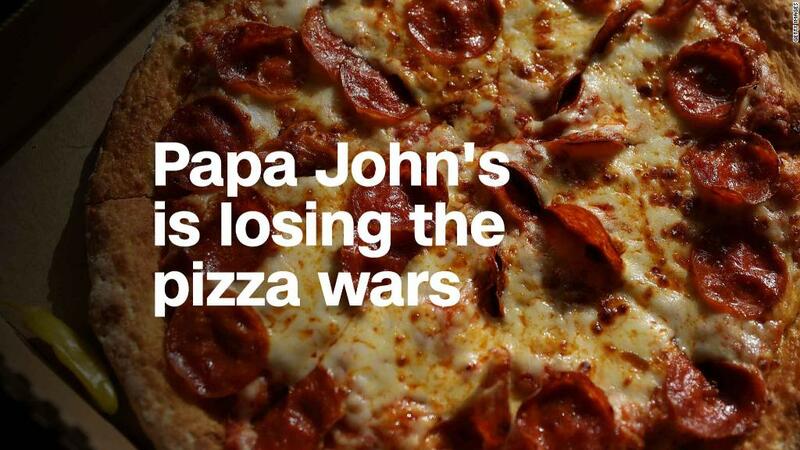 Papa John's is losing the pizza wars. Big time. Papa John's is moving on without Papa John. Does that mean that a takeover of the struggling pizza chain could soon be on the menu? Shares of Papa John's (PZZA) soared 11% last week after the company announced that founder John Schnatter was stepping down as chairman. He resigned after it was reported that he used a derogatory racial slur in a conference call with a marketing firm, and investors seemed to cheer his exit. His departure sparked conversations on social media and elsewhere about Papa John's attractiveness as an acquisition target. Papa John's was not immediately available for comment about merger speculation, but the company could be amenable to a sale given its problems. But who might buy the company if it does wind up for grabs? Most rumors center on Restaurant Brands (QSR), the Canadian company that owns Burger King, Tim Hortons and also recently acquired the fried chicken chain Popeyes Louisiana Kitchen. Restaurant Brands said it would not comment on takeover rumors. Still, analysts at both Credit Suisse and Oppenheimer have mentioned Papa John's in research reports within the past year as being a potentially good fit for the company. Papa John's is currently valued at $1.6 billion. Restaurant Brands paid $1.8 billion for Popeyes. So a purchase of Papa John's seems like it would be fairly easy to digest for Restaurant Brands. Related: How do you rebrand Papa John's when the problem is Papa John's? Buying Papa John's would also help Restaurant Brands become even more like Yum! Brands (YUM), the restaurant conglomerate that owns KFC, Taco Bell and Papa John's rival Pizza Hut. Restaurant Brands might be the most logical candidate but it's certainly not the only one. European food giant JAB bought fast casual sandwich chain Panera in 2017 for $7.5 billion. The company, which also owns Krispy Kreme, acquired both Au Bon Pain and Pret A Manger earlier this year and could make sense as a buyer of Papa John's. Inspire Brands, the private equity-backed firm that owns Arby's and bought Buffalo Wild Wings last year for nearly $3 billion, could be another possible Papa John's suitor. There's also Darden Restaurants (DRI). The Olive Garden owner has shown a willingness to do deals. It purchased Cheddar's Scratch Kitchen in 2017 for $780 million. To be sure, Papa John's could very well remain independent. But the decision could largely depend on what Schnatter wants to do. Even though he's being phased out as the company spokesperson and is no longer chairman, Schnatter remains on the board and is the company's largest shareholder -- with a nearly 30% stake. But Papa John's faces tough competition. Rival Pizza Hut took over as the NFL's pizza sponsor after Papa John's ended its deal with the league last year. That separation followed comments from Schnatter that blamed football players' National Anthem protests for weak sales. Domino's (DPZ) is also hurting Papa John's. It has embraced mobile technology that allows people to tweet emojis and use Facebook's Messenger to order pies. Domino's has posted strong gains in sales lately and the stock is near a record high. Papa John's stock, on the other hand, is down nearly 10% this year and it has plunged more than 33% in the past 12 months. Sales fell in the first quarter of 2018 and analysts are predicting that both revenue and profits will continue to drop for the remainder of the year. So unless Papa John's turns things around soon, Schnatter and the rest of the board could decide a sale of the company might make sense.